SHOWNOTES: We have a stacked show for you guys. 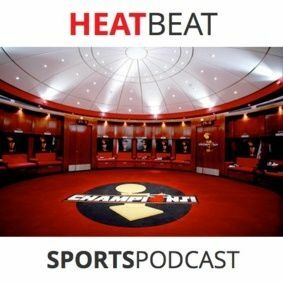 We have Miami Heat Broadcaster, Eric Reid, on the show! Roger Federer retaliates at Gianni with the help of Dwyane Wade’s Instagram. Brian tells us where the missing Malaysian plane is hiding. We find out how and why Gianni misspelled both the Pope’s name and Radioshack in his story. And we go in-depth into Dwyane Wade’s maintenance “shock therapy” program after Tim Grover speaks out. We’ve also got new segments! “Brian’s Time To Shine” & ... See More “Message In A Bottle.” And of course we spend our entire “Around The League” talk on the latest of the Paul George Catfish Saga. If you like the show, feel free to send us an email at: heatbeatmiami@gmail.com or tweet us @HeatBeatMiami, @byBrianGoins, & @GNavas103. We want to interact with #HeatNation and get you guys involved!